Los Angeles is home to a huge Armenian and Persian community so the local grocery store where we shop carries a type of flat bread called lavash, a very thin flat bread made of flour, salt and water commonly found in these cultures. 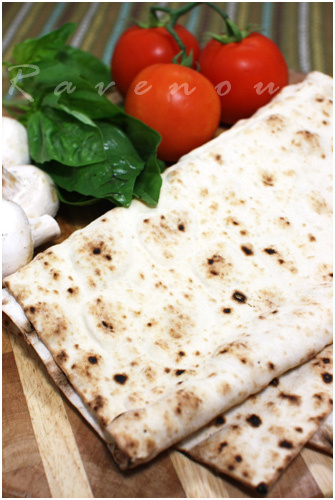 Lavash is much thinner than pita and comes in large flat sheets. They’re great for making lavash chips (see our pita chip post) and wraps. A few weeks ago, our friends the The Food Addicts made their own flat bread pizza—inspired, but not quite as talented or industrious to make our own dough, we decided to experiment and make lavash bread pizza since when baked, lavash becomes ultra crispy and light. So if you like ultra thin and crispy pizza crust, then this bread is for you. Lavash bread can be found at middle eastern and mediterreanean markets and goes for about $1.50 for 1lb of bread. Here in LA you can find it at Jons. We made a date night at home and created a mini pizza bar of various ingredients including Roma tomatoes, basil, feta cheese, mushrooms, caramelized onions, roasted garlic, and slices of Italian pepperoni. For a tomato sauce, we had a jar of LaFamiglia Del Grosso’s Puntannesca sauce we received as a gift from the recent Stir It Up event. This isn’t so much a recipe, since it’s just a matter of putting on any toppings that you like. Because the lavash is very thin, there’s just a few tips you should keep in mind. Fresh herbs: we like to add the basil after baking so it doesn’t wilt. Pre heat oven to 400 degrees. 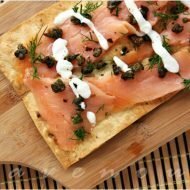 Lightly brush or spray olive oil on the lavash bread and sprinkle your desired seasoning on top. Place your “dry” toppings–mushrooms, tomato, pepperoni, cheese, etc. Since the bread is quite thin, don’t overload it and spread toppings around. On a baking pan or cookie sheet, bake approximately 8-10 minutes or until lavash is golden brown at the edges. If you have a pizza stone use that instead, but we’re not sure if it make a big difference in this case. If you’re using wet ingredients such as tomato sauce, bake the lavash first for about 4 minutes, then remove and as the lavash bread cools, it will become quite crisp. Add a light layer of sauce at this point, then any additional ingrediants and place back in the oven and bake until edges turn golden brown, another 4-6 minutes. It’s really fun to try different combinations and something your kids can help create and be proud of. No messy dough and something you can put together from common items in your fridge in minutes. Scrounging around for ingredients, we had some left over Spicy Shrimp Curry from one of our favorite Thai restaurant, Jitlada and made shrimp curry lavash pizza. Crazy we know, but after the first bite, both stared at each other and agreed–it was our favorite of the night! I shared this experience with my Persian and Armenian coworkers and they’ve never heard of this and they eat lavash all the time! So while pita may be more well known, lavash is actually our favorite flat bread because it’s so thin and so easy to work with. 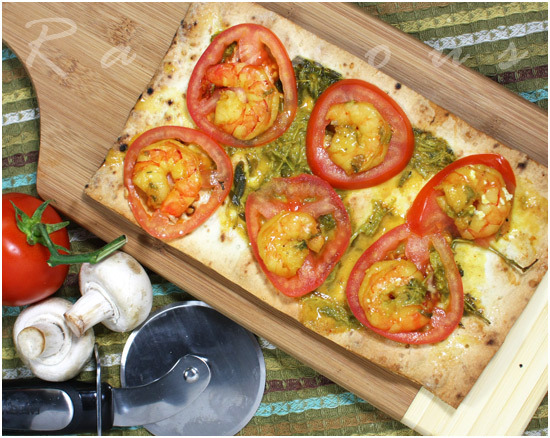 Get creative and try our easy lavash pizza with your family! This is such an ideal recipe for a week day dinner. I normally use wholemeal pita bread if I don’t have any pizza dough in the freezer. Simple easy and perfect. Definitely a meal worth making. I feel like making the one one with mushrooms. Or the Fresh basil and tomato. Anh: No "real" cooking at all so it was perfect for a weekday meal. 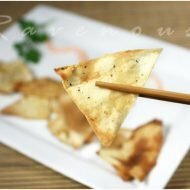 Noobcook: It's great when we learn about new products and Lavash is something new but really useful. Jenn: the fresh veggie lavash pizza were really delicious. Pizza on demand! And yet so wholesome and fresh. The way it should be! Who's gonna use frozen pizzas when you have more delicious shortcuts like these, I wonder? Oh, I'm eyeing that über-thin "pizza crust"!!! Lavash is fantastic. Ju: it's definately easy and quick when you're using left over shrimp curry! [eatingclub]vancouver: the crust is so thin and crispy like a cracker! hey guys! thanks for the mention in your post but we are in no ways talented in making dough! besides, i think its easier to just buy dough at the market (which we did a couple times at fresh and easy). we haven't tried lavash before, but it definitely looks great and crunchy. doesn't the caramelized onions taste amazing on pizza? sometimes when i'm bored, i'll make caramelized onions and put it in a tupperware and just eat it with everything. yikes. 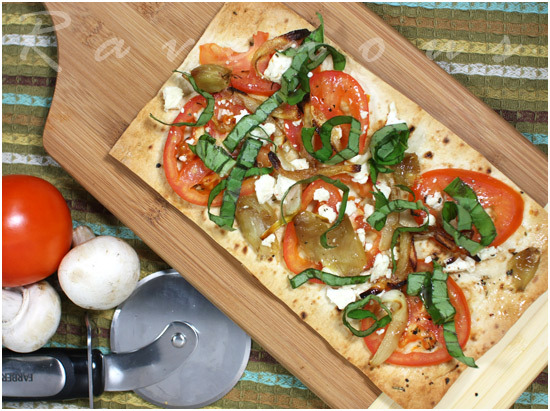 I've been making pizzas on naan bread lately, need to try one with lavash, sounds excellent! yum, I love pizza with flat crispy crusts! This looks interesting and delicious. I have not seen flatbread here. Would love to try if I ever come across. This sounds like a great idea, especially to serve at a party where each guest can request personalized toppings. Lavish Lavash I will call it! I mean, look at those ingredients. They are everyday ingredients but look so fresh. The freshness and your generosity in the pizza toppings….it's awesome! What a great idea! 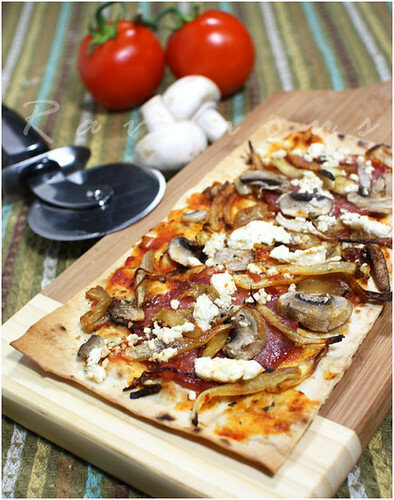 I love thin crust pizzas, and this looks like a great and easy way to achieve that at home. Oh, lavash was really big for us growing up in Hawaii. We didn't know where it came from but thought it was so different and tasty. Never thought of making it into a pizza so this is genius. Your ingredients look so fresh! OMG that looks so delish. It just goes to show the simplest things are the best. we've both been out of town so haven't been good at replying, but thank you all for comments! Lavash is by far the best option for bread I can find! It's thin, satisfying, and tasty. If you are looking for a place to purchase some, the California Lavash brand is my favorite and can be found at Whole Foods Markets (at least in northern and I think southern California); it comes in Whole Wheat, Original, Spinach, and Pizza Flavored. Trader Joe's has whole wheat and original lavash as well. Never heard of lavash but I like thin crusted pizza like this! Whoa! This pizza recipe is surely healthy and delicious. Hmmm… I guess this is a perfect treat for my girlfriend. You know, she's been maintaining her shape since she had her liposuction at Tampa. Well, she's too watchful about the foods that she's eating and follows the diet tips. Now, it's time to give her treat because she has a successful diet program. I'll save this link so I can follow this recipe. 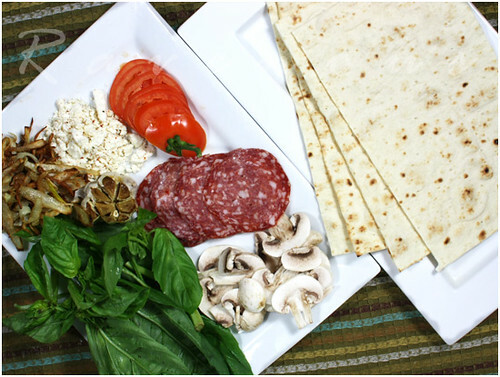 I LOVE making pizza with Lavash! I love lavash in general I use it all the time for wraps and snacks and chips. Just awesome that stuff! I am Iranian and my mom makes the most delicious pizzas like that. She made one with caramelized onion and spinach with some cheese on top. Yummmm! loves this bread. I was able to look at your site via Google Recommendations. Thanks for sharing.